Increasingly, industry is turning to deep learning technology to solve manufacturing inspections that are too complicated, time-consuming, and costly to program using traditional machine vision. Cognex ViDi is the first deep learning-based software designed to solve these complicated applications for factory automation. Deep learning technology uses neural networks which mimic human intelligence to distinguish anomalies, parts, and characters while tolerating natural variations in complex patterns. Deep learning offers an advantage over traditional machine vision approaches, which struggle to appreciate variability and deviation between very visually similar parts. In factory automation, deep learning-based software like VisionPro ViDi can now can perform judgment-based part location, inspection, classification, and character recognition challenges more effectively than humans or traditional machine vision solutions. Unlike machine vision systems, which operate via step-by-step filtering and rule-based algorithms, deep learning-based image analysis software learns by example—as a human would—from a set of annotated training data and images which represent a part’s known features, anomalies, and classes. During training, the software develops neural networks that can model a part’s normal appearance and defects. During run-time, the software locates parts, extracts anomalies, classifies parts, and even deciphers hard-to-read characters with speed, robustness, and precision. 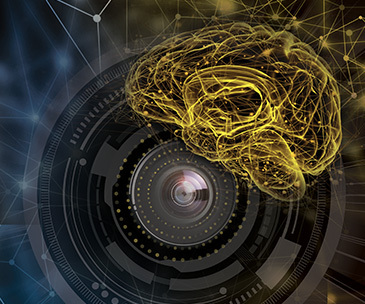 Cognex Vidi Suite is is the first deep learning-based image analysis software designed specifically for factory automation. The Cognex VisionPro ViDi Blue-Read tool is a dedicated solution that solves challenging OCR applications right out of the box. Vidi Blue-Read deciphers badly deformed, skewed, and poorly etched codes using optical character recognition (OCR). Vidi Blue-Read is easily retrained on application-specific fonts and mis-read characters. The pretrained font library identifies most text without additional programming or font training for fast, easy implementation. With an easy-to-use interface and no vision expertise required, ViDi Blue-Read dramatically reduces development times while providing robust, reliable results. Watch a short demonstration to see how quickly and easily the ViDi Blue-Read tool can solve your challenging OCR applications.